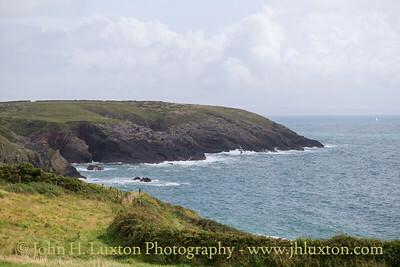 The Chapel of St Non is located on the coast near St David's in Pembrokeshire, West Wales. 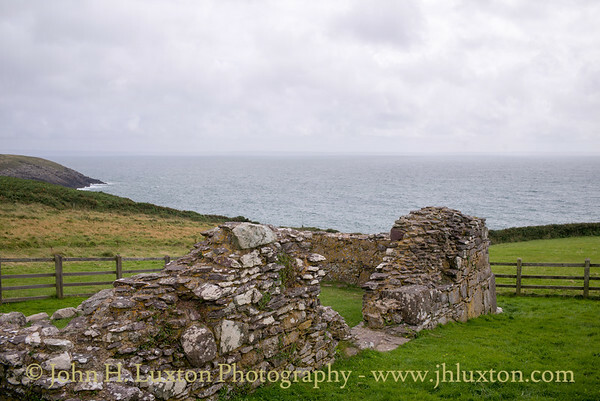 Held by tradition to mark the birthplace of St David, the ruin cannot be accurately dated but is unusual in that it is aligned north-south rather than the usual east-west. 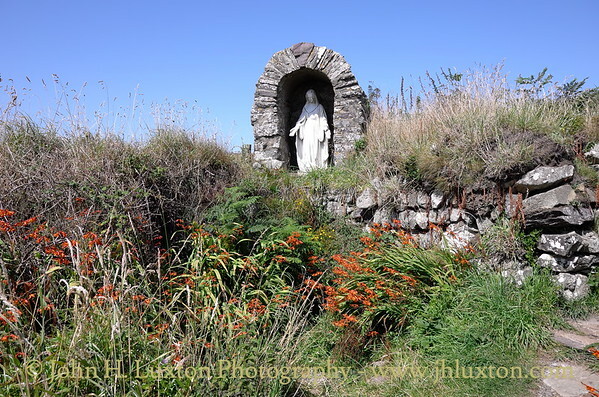 Near to the ruined chapel is a retreat centre, a modern chapel and a shrine and holy well. The site is now the responsibility of the Welsh National Heritage organisation Cadw. The St. 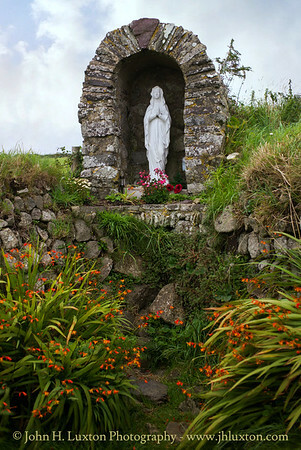 Non Well Shrine constructed in 1951 using stone from the ruins of the chapel. The statue has changed since 2015. 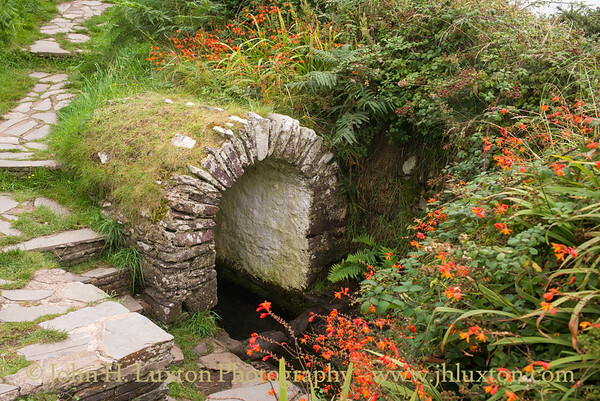 Close up of St Non's Well into which many coins have been cast. 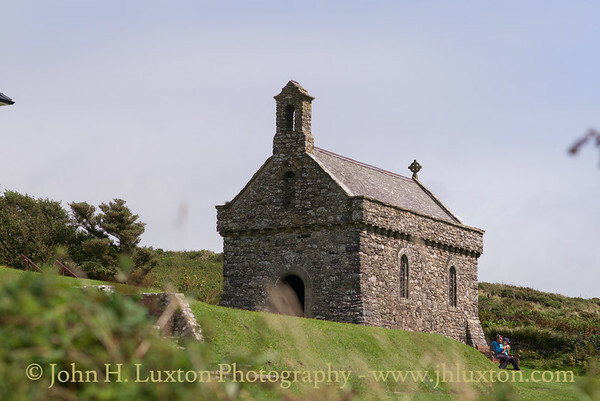 Saint Non was the mother of St David who gave birth at this location around 500AD a chapel was constructed near the site of the holy well which is said to have sprung forth during a Thunderstorm at the time of St David's birth. 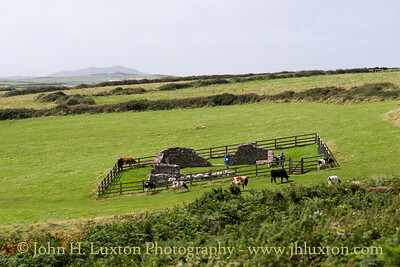 The fence encloses the remains of the chapel now in the care of CADW. 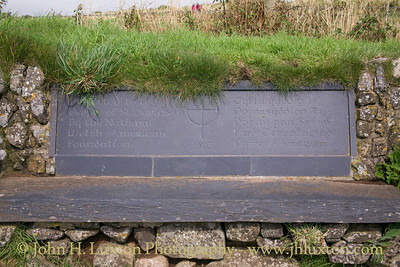 Saint Non's Cross - Saint Non was the mother of St David who gave birth at this location around 500AD a chapel was constructed near the site of the holy well which is said to have sprung forth during a Thunderstorm at the time of St David's birth. The fence encloses the remains of the chapel now in the care of CADW. 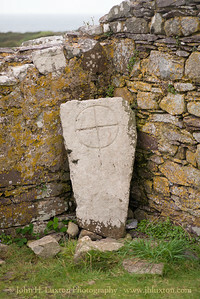 Saint Non's Cross. 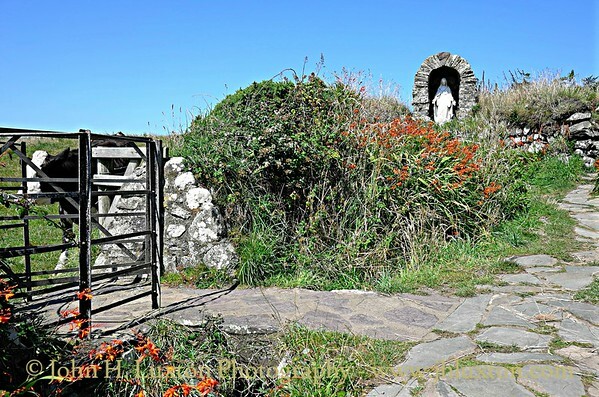 Saint Non was the mother of St David who gave birth at this location around 500AD a chapel was constructed near the site of the holy well which is said to have sprung forth during a Thunderstorm at the time of St David's birth. The fence encloses the remains of the chapel now in the care of CADW. 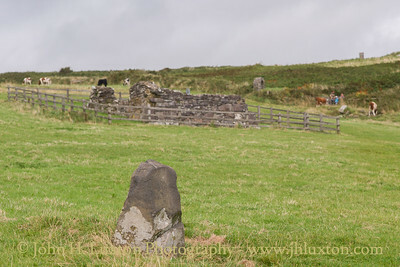 There are several small standing stones in the field around St Non's Chapel presumably early Christians adopted a site which had had some pagan significance? 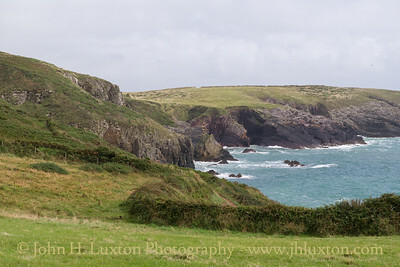 Saint Non was the mother of St David who gave birth at this location around 500AD a chapel was constructed near the site of the holy well which is said to have sprung forth during a Thunderstorm at the time of St David's birth. 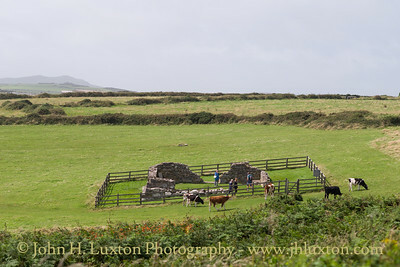 The fence encloses the remains of the chapel now in the care of CADW. 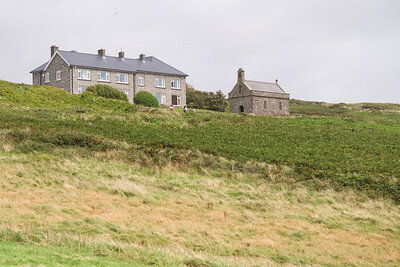 St Non's retreat Centre and modern chapel built in traditional style. 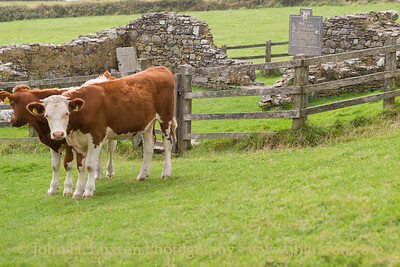 Cattle at St Non's Saint Non was the mother of St David who gave birth at this location around 500AD a chapel was constructed near the site of the holy well which is said to have sprung forth during a Thunderstorm at the time of St David's birth. 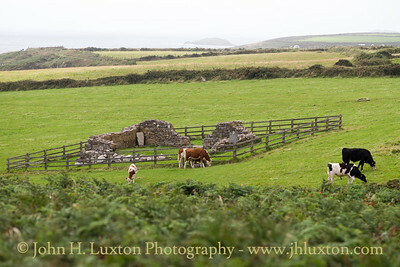 The fence encloses the remains of the chapel now in the care of CADW. 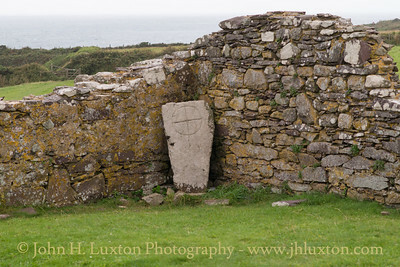 St Non's Chapel remains viewed from the car park. 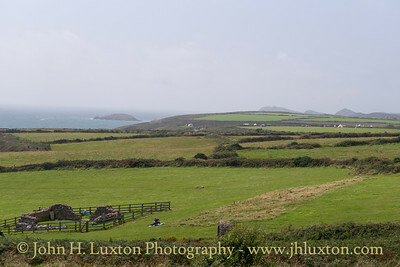 Saint Non was the mother of St David who gave birth at this location around 500AD a chapel was constructed near the site of the holy well which is said to have sprung forth during a Thunderstorm at the time of St David's birth. The fence encloses the remains of the chapel now in the care of CADW. The 20th Century Chapel of "Our Lady and St Non" which was built in 1934. 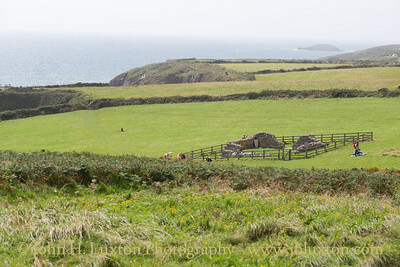 Mr Cecil Hubert Morgan Griffiths, a Carmarthen solicitor, had it built in the native style used on the Pembrokeshire coast as early as 500 AD. 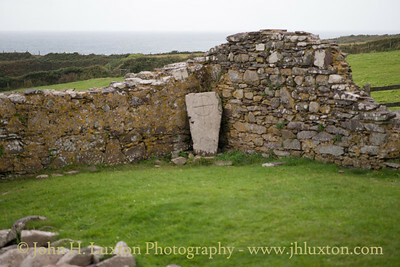 It contains many stones from ruined pre-reformation chapels in the area. 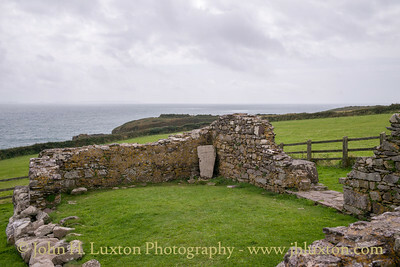 The fenced enclosure surrounds the ruins of the chapel of St Non. 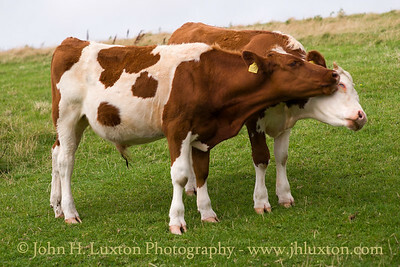 Saint Non was the mother of St David who gave birth at this location around 500AD a chapel was constructed near the site of the holy well which is said to have sprung forth during a Thunderstorm at the time of St David's birth. The fence encloses the remains of the chapel now in the care of CADW. 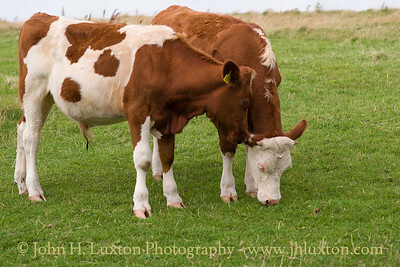 Another cow heads towards the overflow from the holy well on the opposite side of the enclosing hedge.